My dear Fathers, The year has ended, seemingly, very rapidly, that means the year dedicated to our beloved Apostle St. Joseph Vaz is to be concluded at the end of this month. There have been many programmes of renewal during this year and we have endeavoured to be inspired by the indefatigable zeal of the greatest missionary born in Asia. As we have already discussed at our presbyteral meetings, we still have to deepen the experience of our faith and the renewal of our missionary commitment at all levels. 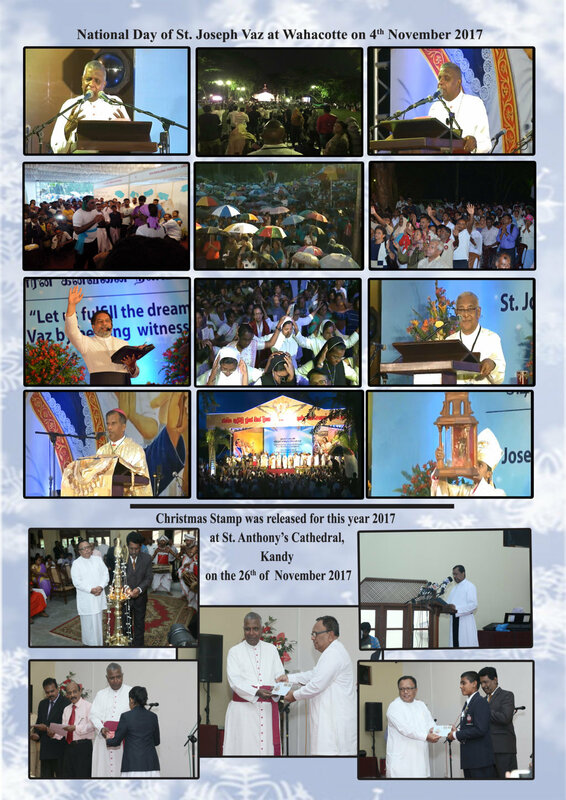 Therefore, year 2018 will be dedicated in our diocese as the year of “Deepening our faith in view of becoming powerful witnesses to Lord Jesus and to the Gospel”. At our forthcoming meetings, we shall further discuss the programme envisaged for 2018. The ceremony in connection with the issuing of the Christmas stamp was held at our Cathedral premises with the Minister of Post and Telecommunication, Honourable Minister M.H.A. 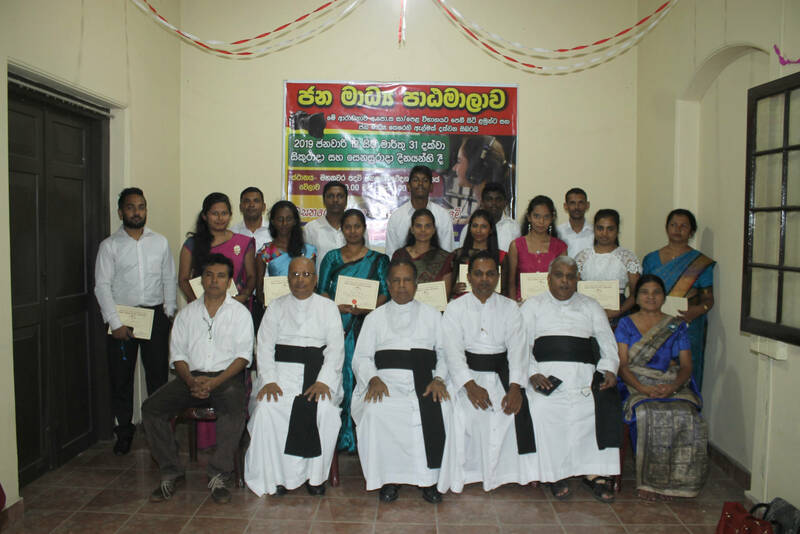 Haleem, as well as the Director of Christian Affairs Mr. A. R. Gunawardena and other Ministry Officials. It was a simple but a beautiful ceremony that had been organized very well by Fr. Ivan Jayasundera, the Parish Priest of the Cathedral and his Assistant Fr. Roshan Dilrukshan. I wish to convey my sincere thanks to them for a job, well done. 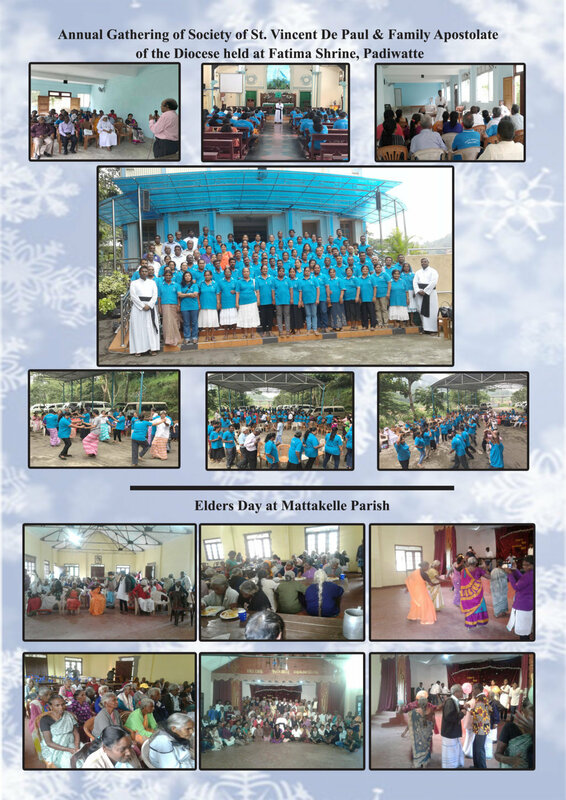 On the 29th of November, the Church and the premises of St. Xavier’s Church, Nuwara Eliya was declared as Sacred Area by a special gazette issued by the Government, gazette No 1877/18-2014 Aug 29. The ceremony was presided over by the Minister of Plantation Industries Honourable Minister Navin Dissanayake. The Parish Priest, Fr. Nerio Abraham and his Assistant Fr. 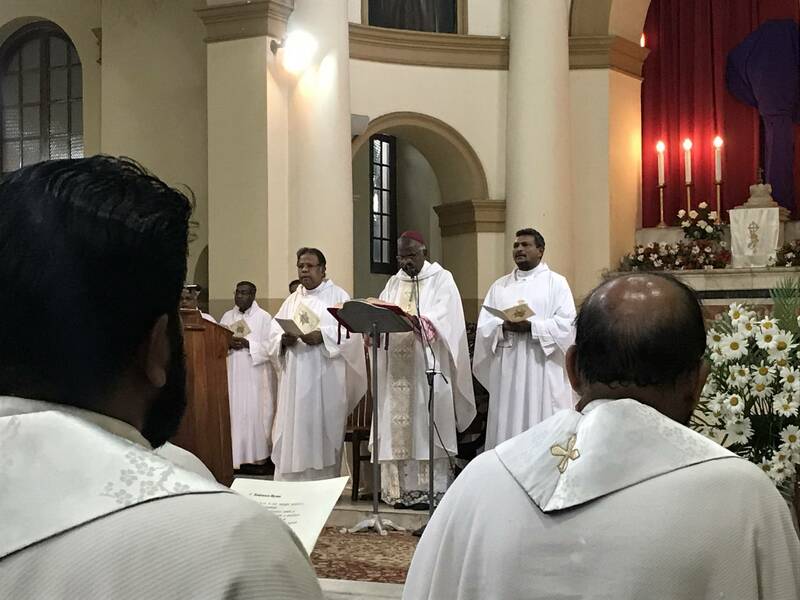 Leonard Wijeratne, together with the parishioners, had organized this ceremony in a meaningful manner. 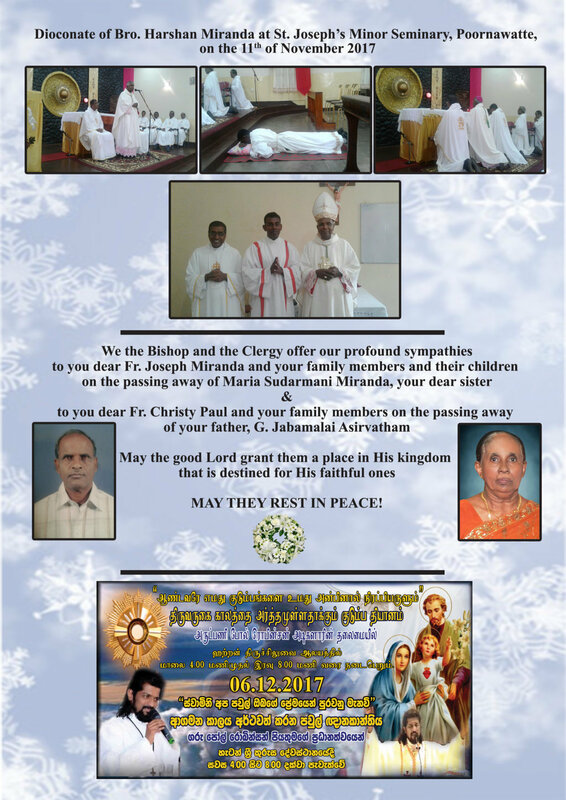 The declaration of St. Xavier’s Church and the premises had been requested by the former Parish Priest of Nuwara Eliya Fr. Leslie Perera and the parishioners in view of reclaiming also the Church land and around St. Xavier’s Church. Our gratitude is due to Fr. Leslie Perera for his zealous and persistent efforts to ensure that St. Xavier’s Church and it’s premises are preserved as a Sacred Area. The Bishops’ Conference has issued it’s Christmas message for this year. Please diffuse the message among our faithful as it is very meaningful for our context this Christmas. The need to be sensitive to the poor and marginalized around us as we contemplate the infant Saviour in the stable of Bethlehem, is brought out very clearly. The poor must be our main focus in our Christmas celebrations. We are also called upon to be specially considerate towards the spiritually poor, the youth and the children, who are in need of our compassionate pastoral care. Our concern has also to be extended to the unborn children and prevent their wanton destruction. We have repeated once again that abortion is intrinsically evil. I was happy to meet Fr. Guiseppe, who is now retired but he is continuing his work of supporting our children in their education through the sponsorship scheme. He sends his fraternal greetings and loving regards to each and every one of you, whom he considers as his own brothers in the priesthood. Please remember him in your prayers as his health condition after the second heart surgery is quite delicate. He requests that all children who are being sponsored ,write a letter of thanks to the benefactors at this Christmas without fail. I am sending in a separate latter , the draft of the letter of thanks to the benefactors in Italian to facilitate matters. Please attend to it without fail. 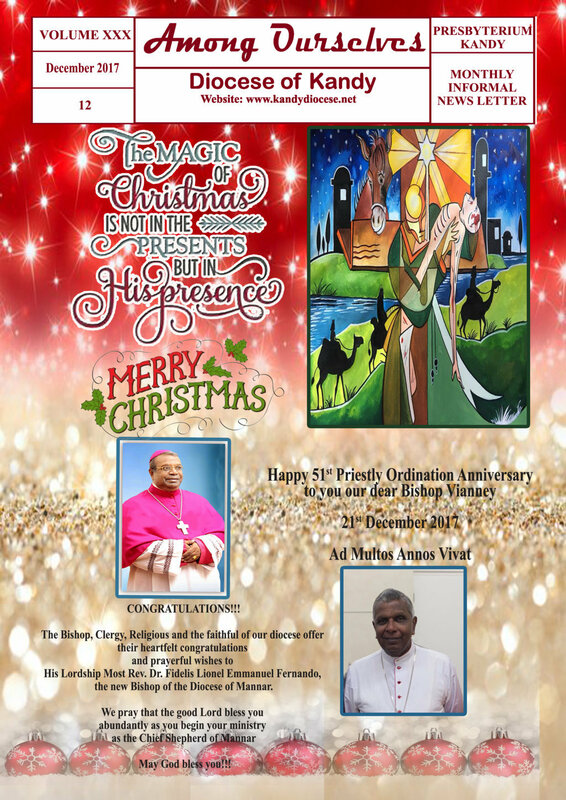 We shall meet for Christmas gathering and our Monthly Recollection on the 18th and 19th of December. Until then wishing you God’s blessings and in union of prayers. of service of the Sylvestro–Benedictine Monks to the College. 10th – 9.30 a.m – Blessing of the Rattota Church after Renovations. The liturgy can only celebrate the events that are historical as they are the memorial of the actions of God in our lives. But we cannot celebrate the events that we await, such as Christ’s coming in judgment and the realization of the Kingdom. So from first Sunday of Advent to 16th December (first part of Advent) the remembrance of the events of the incarnation are not excluded since it is on the basis of these that we look forward to the second coming. In the second part of Advent, the first readings are the eight most famous Old Testament Messianic predictions. Each one of them speaks of One–to –Come, of the future Anointed One: Messiah. In these eight Masses the Gospel is taken exclusively from the Infancy narratives of Matthew and Luke – from the first chapter only of each of these Gospels. In this way we read the events which immediately prepared for the Lord’s birth. The “O Antiphons” The liturgy uses, from December 17 to 23, seven short prayers that have special richness and importance. Known as the “O Antiphons” or the “Greater Antiphons”, these prayers compress and express the Old Testament Messianic hope for Christ. These antiphons are read each day at Vespers of the Roman Breviary and are used as the Alleluia verse of the Advent Masses. The unknown author of the “O Antiphons” knew and loved the Bible, and saw Christ in His Old Testament background. So the antiphons gives good example for our Advent spirit. The Advent Wreath The origins of the Advent Wreath are found in the folk practices of the pre-Christian Germanic peoples who, during the cold December darkness of Eastern Europe, gathered wreaths of evergreen and lighted fires as signs of hope in a coming spring and renewed light. Christians kept these popular traditions alive, and by the 16th century Catholics and Protestants throughout Germany used these symbols to celebrate their Advent hope in Christ, the everlasting Light. From Germany the use of the Advent wreath spread to other parts of the Christian world. Symbolism of the Wreath The circular shape symbolizes the coming of the Lord, in the past in flesh, in the present in grace, in the future in glory. The evergreens are a sign of our hope for salvation. Green is the Church’s colour for hope. We are reminded of the everlasting life and the Love that comes to us from God through Jesus Christ. The Candles (three purple and one rose-coloured) are the Light which “shines in the darkness,” coming progressively as each week another candle is lit. The purple candles (for the 1st, 2nd & 4th weeks) symbolize repentance and conversion, clearing away the mountains and filling in the valleys. The Advent Wreath The Advent wreath, with the progressive lighting of its four candles, Sunday after Sunday, until the Solemnity of Christmas, is a recollection of the various stages of salvation history prior to Christ’s coming and a symbol of the prophetic light gradually illuminating the long night prior to the rising of the Sun of justice (cf. Ml 3,20; Lk 1,78). The Blessed Virgin Mary and Advent The Liturgy frequently celebrates the Blessed Virgin Mary in an exemplary way during the season of Advent (115). It recalls the women of the Old Testament who prefigured and prophesied her mission; it exalts her faith and the humility with which she promptly and totally submitted to God’s plan of salvation; it highlights her presence in the events of grace preceding the birth of the Saviour. Popular piety also devotes particular attention to the Blessed Virgin Mary during Advent, as is evident from the many pious exercised practised at this time, especially the novena of the Immaculate Conception and of Christmas. The Christmas Novena The Christmas novena began as a means of communicating the riches of the Liturgy to the faithful who were unable easily to grasp it. It has played a very effective role and can continue to play such a role. At the same time, in current conditions where the faithful have easier access to the Liturgy, it would seem desirable that vespers from the 17-23 of December should be more solemn by adopting the use of the “major antiphons”, and by inviting the faithful to participate at the celebration. Such a celebration, held either before of after which the popular devotions to which the faithful are particularly attached, would be an ideal “Christmas novena”, in full conformity with the Liturgy and mindful of the needs of the faithful. Some elements, such as the homily, the use of incense, and the intercessions, could also be expanded within the celebration of Vespers. 5. Christmas Eve In the space of time between the first Vespers of Christmas and Midnight Mass, both the tradition of Christmas carols, which are potent means of conveying the Christmas message of peace and joy, and popular piety propose certain forms of payers, differing from country to country, which should be cherished and, where necessary, made consonant with the celebration of the Liturgy. 31 December Popular piety has given rise to many pious exercises connected with 31 December. In many parts of the Western world the end of the civil year is celebrated on this day. This anniversary affords an opportunity for the faithful to reflect on “the mystery of time”, which passes quickly and inexorably. Such should give rise to a dual feeling: of penance and sorrow for the sins committed during the year and for the lost occasions of grace; and of thanks to God for the graces and blessings He has given during the past year. Solemnity of the Lord’s Epiphany Many traditions and genuine manifestations of popular piety have been developed in relation to the Solemnity of the Lord’s Epiphany, which is of ancient origin and rich in spiritual content. Why did He come? Why did God send His son to this sometimes cruel and hard world? He sent Jesus to us so that one day, He would grow up to become a very important part of history. His story (history) is one of truth, love, and hope. It brought salvation to all of us. Without Jesus, we would all die in our sins. Jesus was born so one day the price could be paid for the things we have done that are wrong. The Bible says that all have sinned. We are all born with a sin nature. We do things that do not please God. Through the sins of Adam and Eve, we have all inherited that sin nature. We need to have that removed. The only way is through Jesus. Jesus came so He could die on the cross for ALL of our sins. If we believe that Jesus died for our sins, we can ask Him to come into our hearts and forgive us. Then, we are clean and made whole. We can know that heaven is a place where we can go to when this life is over. “But if we confess our sins to him, he is faithful and just to forgive us our sins and to cleanse us from all wickedness.” 1 John 1:9 (NLT) We can truly be happy at Christmas! No matter what may be happening, we can know that we are His children. We then become sons and daughters of God. Heaven will be our home one day. Look at Christmas in a new way this year. This is the year to invite Jesus into your heart. You will then have a “Merry Christmas.” The joy and peace you will receive will last all year as you look to God for all your needs to be met. Jesus Is The Reason For The Season! Rejoice! Today we repeat ‘Merry Christmas’ many times when we meet one another. It is a different greeting. When two non-Christians wish each other ‘Happy Feast’ they mean peace, joy and prosperity to the other and for their family and friends. What does this wish ‘Merry Christmas’ mean to us today? We proclaim to each other the greetings of the angel of the Lord as we heard in the Gospel: ‘… a savior has been born to you: he is Christ the Lord.’ The angel moreover says that this is news of great joy, joy to be shared by the whole people. As we greet one another today we remind each other that in Jesus we have the savior of the world. We have to rejoice, we need to get rid of all our fears. He is not a warrior in the military sense but a humble child lying in a manger. He is one to whom all can have access. He is lying in a place where even the sinful shepherds of Bethlehem can go and pay their homage. Who is this savior born to us? In the first reading Isaiah says that he is the light to the people that walked in the darkness and for those who live in the shadow of death. He is the one who breaks the heavy yoke that is placed on the shoulders of the people and the rod of the oppressors. He takes away the burdens of the people. He will do away with the suffering and pain of the people. To the people who lived in slavery in Babylon this is a matter of great joy. Isaiah compares the joy of the people at the presence of the savior to that of the joy of victory. He will not only be a savior who releases them from all enslaving elements but he himself would become everything to them: Wonder-Counsellor, Mighty-God, EternalFather, Prince-of-Peace. Is Jesus my saviour in the sense of Isaiah? If not, what should I do to make Jesus my savior? Paul gives us the guideline in the second reading. Paul tells us that we need to give up everything that does not lead us to God and all worldly ambitions. We need to be self-restrained and live good and religious lives here in the present world, today. If we are worldly, full of ambition and not trying to meditate the way God wants us to live we may not experience the salvation brought about by Jesus Christ. The Responsorial Psalm gives us an additional guideline to savour the joy the new born child brings us, namely, to recount and proclaim daily the help and graces we receive from God daily. Jesus has come to us in human form to be closer to us, to take us closer to God. Our joy is that he does not belong to the past, but the one born is with us today. Let us rejoice and proclaim the good news as we greet one another ‘Merry Christmas’: Today a Saviour has been born to us. Today we celebrate the feast of Mary, Mother of God, the New Year and the World Day of Peace. Mary becomes the model for us to receive all God’s blessings and live peaceably. The Gospel portrays Mary as our model for Christian living, who treasures the ways of the Lord and ponders them in her heart. Being a member of the human family, as a young girl she did not understand the ways of the Lord, but she abandoned herself to the will of God. In the Old Testament the priest goes to the altar to perform the sacrifices and comes out to proclaim the blessings on the people, who stand outside the place reserved for priests, in the name of the Lord. It is this blessing that is given in the first reading. The blessing says that the Lord may bless and keep you always in his friendship and under his care and free you from all dangers; may he be gracious to you in granting whatever you need in his love and may he bring you peace, that is, well being in everything. It means that one become a friend of God, a son or a daughter of God. Mary became the Mother of God. She received all the blessings from God. Not only she received God’s blessings, by her obedience she was instrumental in us receiving God’s greatest blessing in his son, ‘born of a woman’. Thus according to Paul in the second reading, Jesus who was born of Mary made us sons and daughters of God. We are not sinners any more, but heirs to God’s blessings. Mary became the Mother of God, received God’s blessings and intercedes for peace in the world even today, in obedience to God’s will. We honour her for her obedience to God’s plan. The Church not only looks at her as the Mother of God but also as our Mother, the Mother of the Church. She was like us human beings but received the crown of glory through her obedience to God. She is a model for us to become divine. She is our model to receive heavenly glory, namely to obey the will of God in everything; to live as children of the Heavenly Father. Let us treasure the blessings of God in our hearts and daily meditate on God’s words in imitation of Mary. Eventually we will experience not only God’s blessing but would be transformed into the image of God. We will gradually become instruments of peace. Pope Francis in Evangelii Gaudium says ‘Mary was able to turn a stable into a home for Jesus’ (no. 286). Thus she becomes our model, namely, in her poverty she gave a rich experience, the motherly care to Jesus. Even with our limitedness and poverty we can still make Jesus comfortable in our lives. Jesus is willing to receive that care from each of us, so that he can give us all the blessing we need in life, especially peace. Let us ask Mary, the Mother of God and our mother to intercede for us, so that in imitating her we may become real sons and daughters of God. I had a dream Joseph. I don’t understand it, not really, but I think it was about a birthday celebration for Our Son. I think that was what it was all about. The people had been preparing for it for about six weeks. They had decorated the house and bought new clothes. They had gone shopping many times and bought elaborate gifts. It was peculiar though, because the presents were not for our son. They wrapped them in beautiful paper and tied them with lovely bows, and stacked them under a tree. Yes, a tree Joseph, right in their house. They decorated the tree also. The branches were full of glowing balls and sparkling ornaments. There was a figure on the top of the tree. It looked like an angel might look. Oh, it was so beautiful. Everyone was laughing and they were very happy. They were all excited about the gifts. They gave the gifts to each other, Joseph, not to Our Son. I don’t think they even knew Him. They never mentioned His name. Doesn’t it seem odd for people to go to all that trouble to celebrate someone’s birthday if they don’t know Him? I had the strangest feeling that if Our Son had gone to this celebration, He would have been intruding. Everything was so beautiful Joseph, and everyone was so happy but it made me want to cry… How sad for Jesus not to be wanted at His own birthday party. I am glad it was only a dream. How terrible Joseph, if it had been real. “Let’s put Christ back into Christmas” for then there will be peace on earth for all men. On Sunday Pope Francis said that when the Final Judgment comes, what will matter most is how much we loved God and others, especially through daily, concrete acts of charity toward those most in need. “At the end of our life we will be judged on love, that is, on our concrete commitment to love and serve Jesus in the least of our brothers and the needy,” the Pope said Nov. 26. “Jesus will come at the end of time to judge all the nations, but he (also) comes to us every day, in so many ways, and asks us to welcome him.” Pope Francis spoke to around 30,000 people gathered in St. Peter’s Square before leading the Angelus prayer. Celebrating the Solemnity of Christ the King, the Pope offered a reflection on the Last Judgment and Jesus’ “criteria” for entering the Kingdom of Heaven. After the Angelus Pope Francis expressed his sorrow for the attack on a mosque in Sinai, Egypt on Nov. 24 which killed more than 230 people and wounded hundreds more. “I continue to pray for the many victims, for the wounded and for the whole community, so severely affected. God frees us from these tragedies and sustains the efforts of all those who work for peace, concord, and coexistence,” he said.